In today’s lesson we will learn about a new kind of number. We’ll begin at the beginning with a brief history of numbers. Let’s take a minute to process this; we just discovered a whole new kind of number. We call them irrational numbers, and they are numbers that cannot be written as fractions of whole numbers . There are many examples of numbers like this, perhaps none more famous than the mysterious number , that relates the diameter of a circle to its circumference. At this point then we have considered four different types of numbers. The natural numbers: 1, 2, 3, 4, etc. The whole numbers, or integers: …, -2, -1, 0, 1, 2, etc. In this next section we will consider the sizes of each of these sets of numbers. In particular, we will show that some infinities are bigger than others! In 1874 Georg Cantor – the father of set theory – made a profound discovery regarding the nature of infinity. Namely that some infinities are bigger than others! The story begins with the notion of a countable set, we think of the natural numbers as being countable in that we can put them in a list and count through them (clearly we will never reach the end of the list, but the process of counting them makes sense). This is somehow the building block for defining countable sets, as we think of a general set as being countable if there exists a bijection between it and the naturals. Remember, a bijection just means that we can match up each element in one set with an element in the other set, without missing any elements out. Here are some examples of a bijections. In particular, we note that being countable, i.e., in bijection with the natural numbers, just means that we can write out our numbers in a list and in such a way that we don’t miss any out. Let’s do a harder example. We can show they are countable by writing them in a table as follows. and will go on to contain every rational number. 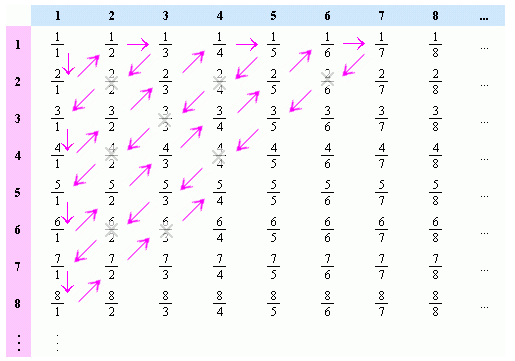 This shows that the rational numbers are countable! Cantor showed that the answer is no! Now here the numbers stretch off infinitely into the right, as real numbers can have infinite decimal expansions, and obviously stretch infinitely far down. The letters represent numbers between 0 and 9, so may be the number 0.12321… . It is unimportant what the specific numbers are, only that we can write them in such a list. Now, along the diagonal of this list the numbers that have been emboldened form a number; it begins . With this we define a new number, called D, by adding 1 to each digit with the convention that if a digit is 9 then adding 1 goes to 0. In this way we have that the first digit of D is . So if the first number really did start 0.12321, then D would start 0.2…, for example. Now this number D is surely a real number, and moreover it certainly lies between 0 and 1. Thus if the above list is, as claimed, complete it should contain D.
Where does our new number belong on this list? Is it the first number on the list? No – it can’t be since they differ in the first position? The first digit of is whereas the number in the list starts with . Is it the second number in the list? Again no. This time we see that it differs in the second digit. The second digit if is defined to be , whereas the second number in the list has second digit . Continuing in this way we see that in fact cannot belong anywhere on the list! We have therefore found a real number that does not belong to this list. But this list was supposed to contain all real numbers!